It’s the tail end of maple syrup season in the Northeast, where the maple trees are tapped and the sap is harvested and boiled down. According to a recent article in the New York Times, Vermont produces the majority of the maple syrup in the U.S., producing some 500,000 gallons this year, but Maine, New York and even Ohio (my home state) hold their own, each producing more than 100,000 gallons a year. Canada, specifically Quebec, far surpasses the U.S. in syrup production, producing several million gallons last year. The difference largely stems from the fact that Canada taps one third of its trees where Vermont only taps about two percent. In the article, I also read that the majority of domestic producers here are family operations, using the traditional technique of boring a hole in the tree and inserting a tube to collect the sap in buckets as it runs down. 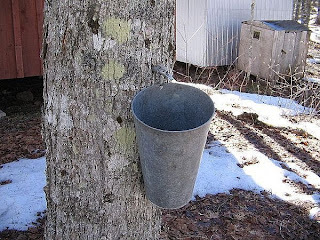 Larger scale operations (like those in Canada) often use more efficient practices like tapping the tree with plastic tubing with suction, then pumping it directly into a building where the syrup is produced. The precision and care involved in traditional methods all seem hopelessly romantic to a girl living in the concrete jungle of Chicago. As a kid, my schoolmates and I would take field trips to local maple syrup producers to see the tapped trees. We’d also visit the sugar shacks where the syrup is boiled down, and finally taste the fresh syrup. There has always been something magical about pure maple syrup. But until my adult life, I never realized it was due to the fact that Mrs. Butterworth’s and other commercial brands of syrup are typically maple-flavored high-fructose corn syrup. There’s a place for these imitation syrups, since pure maple can cost upwards of $9 for an 8.5 ounce bottle, but nothing beats the original. Maple syrup season is the perfect time for homemade pancakes. I got a real taste for pancakes this weekend after I read a post on the Amateur Gourmet blog about cream of wheat pancakes, with a crusty outside and warm gooey center, the writer had at a brunch spot in NYC. Those I made below are not quite as exciting, but I do love apple cinnamon pancakes, and below is a simple recipe that works well. I substituted 1 tablespoon of sugar with spiced sugar from a local outlet, The Spice House, which consists of cinnamon, cloves and brown sugar, among other things. You don’t have to do this but the other spices added a complexity to the flavor of the fluffy cakes that I enjoyed. I just did a recipe of sweet potato spears glazed with maple syrup that was dead easy and well-received at the party I took them to. Basically, just eighth the sweet potatoes, brush with butter mixed with allspice and then bake for about 40 mins at 350. Remove and drizzle liberally with maple syrup (a few tablespoons should do it) and put them back in on a low broil for about 7 minutes to crisp up. Hey DJB – can you email me when you get a second? I have a question for you. Thanks, and thanks for commenting!